A man accused of murder has described his co-accused beating the victim with a pool cue and fence post and dragging him to a field where he was set alight. The court heard that Barry Smith was killed in a revenge attack after a woman was sacked for making a racist remark towards him. 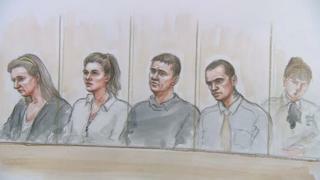 Vincent Aitken, 44, his daughter, Emma Aitken, 18, and her partner Nathan Doherty, 27, deny his murder. In his defence, Nathan Doherty said Mr Aitken was responsible rather than him. Image caption Barry Smith's family said he was a "well-loved Gypsy man"
Mr Doherty, of Portland Street, Derby, told Leicester Crown Court he, Vincent Aitken and Emma Aitkin had been drinking with Mr Smith at Kilburn Welfare Social Club, in Derbyshire, last October. Mr Aitken's wife, Pamela, 41, who has denied assisting an offender, lost her job at the club after making an alleged racist remark towards Mr Smith. Mr Doherty said on the evening of Mr Smith's death they had all had a lot to drink. He said he went to show Mr Smith out of the door, but as he held it open Vincent Aitken rushed past him and attacked Mr Smith repeatedly with a pool cue and stamped on him. The jury heard that despite efforts by Mr Doherty to stop the attack and put Mr Smith in the recovery position, Mr Aitken continued to drag him down to a field where he was beaten with a fence post. The prosecution has called it a "savage and merciless" attack.